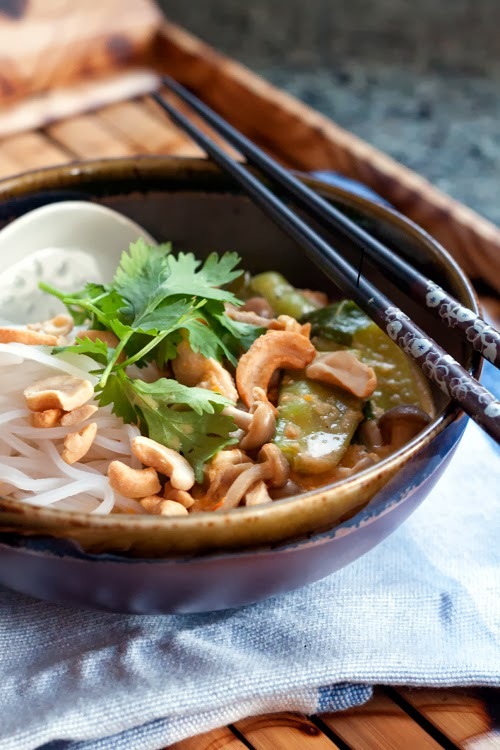 * For those who choose more traditional route, red bell pepper, Thai eggplants and bamboo shoots may be used in this recipe. But really, you can use almost any vegetable you like. Using mortar and pestle, grind the first 7 ingredients until they turn into paste. Alternatively, you can use food processor to make the paste. Heat oil in a dutch pan over medium heat. Add curry paste, lemon grass, lime leaves and stir fry until fragrant. Pour coconut milk into the pan, stir to combine and bring to boil. Reduce the heat to medium-low. Continue cooking for another 5-10 minutes, stir often to prevent burnt bottom, until the sauce is reduced and starting to become oily. Increase the heat to medium-high. Add chicken, cook and stir for about 1 minute. Add chicken stock into the pot, stir to combine. Bring to simmer for about 5 minutes, or until the chicken is cooked through. Meanwhile, boil and cook noodles per package directions. Drain and rinse under cool water to prevent sticking. Divide and transfer noodles into 6 individual bowls. Add vegetables into the soup. Season with fish sauce, palm sugar, salt and pepper. Stir until the sugar dissolved and everything is well blended. Cook covered for another 5 minutes, then turn off the heat. Stir in basil leaves. 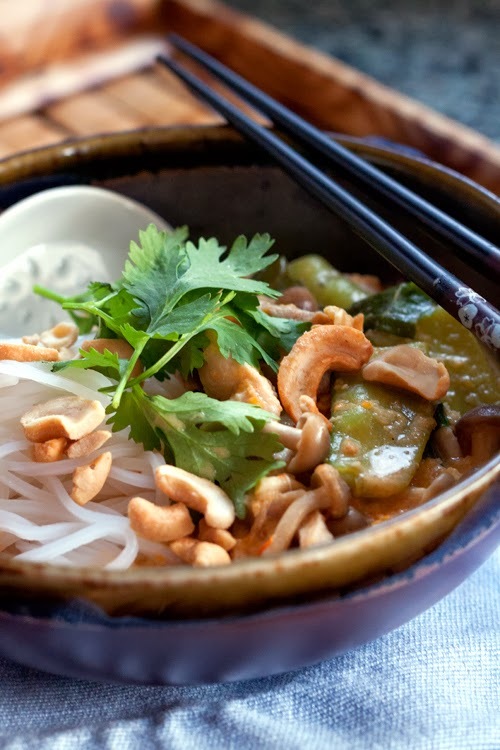 Using a ladle, pour curry onto the noodles, top with cilantro sprigs and sprinkle with cracked cashews/peanuts. Serve hot. Makes 6 bowls of noodle soup, served as main dish. 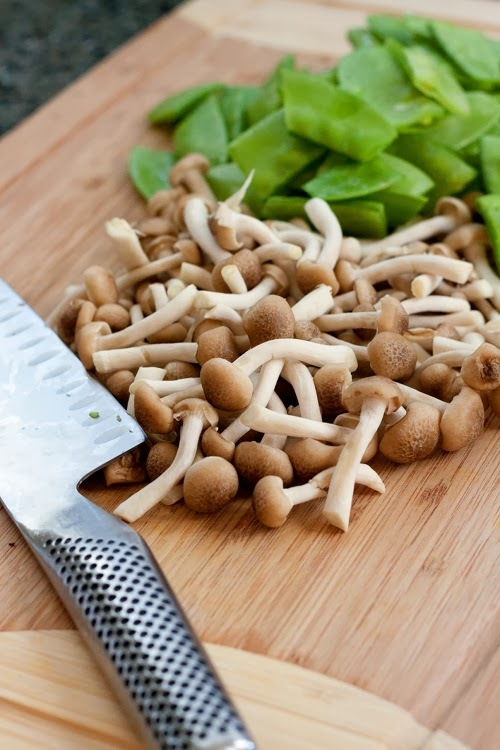 I love those mushrooms! The noodle soup looks warming and delicious. Lovely and fancy photograph too! Can't live without my loyal cobek and ulekan :) For whatever reason, food processor doesn't do wonders for me.